This is a really nice comforter set. Note though that it does not come with sheets. The material is very soft and comfortable. My son loves the design and says it’s very soft. Cruise off to sleep with the Mi Zone Kids Gavin Printed Comforter Set. 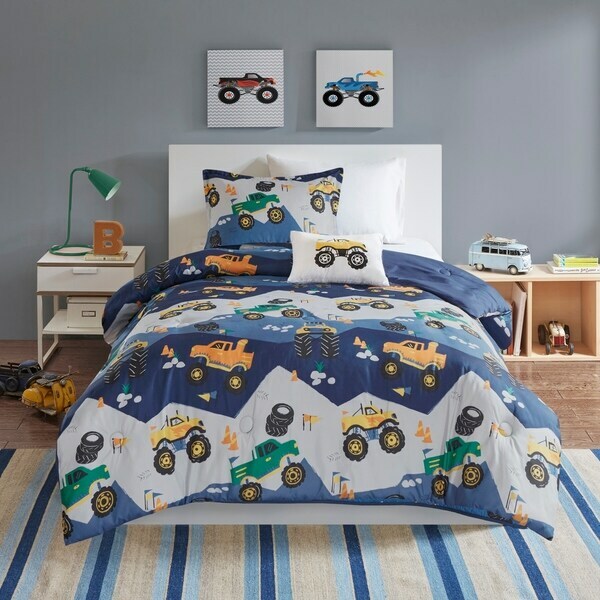 The fun and exciting comforter and matching sham(s) feature a truck print motif in green and orange colors on an ultra-soft blue and grey base fabric. A solid blue reverse complements the top of the bed, while an oblong decorative pillow with hypoallergenic filling flaunts an applique truck on the face completing the comforter set. Machine washable for easy care, this child's comforter set offers an adorable update to your bedroom.